“SHAZAM!” has called down the thunder. Recall back from the Road Runner cartoons and “The Flash” series, Warner Bros. and DC Comics has released their seventh feature film from the DC Extended Universe. Marking his first superhero film, director David F. Sandberg step up in his game to helm this exciting superhero spin-off from the 2017’s “Justice League.” He was widely known for directing “Annabelle: Creation” which is part of “The Conjuring Universe” franchise. 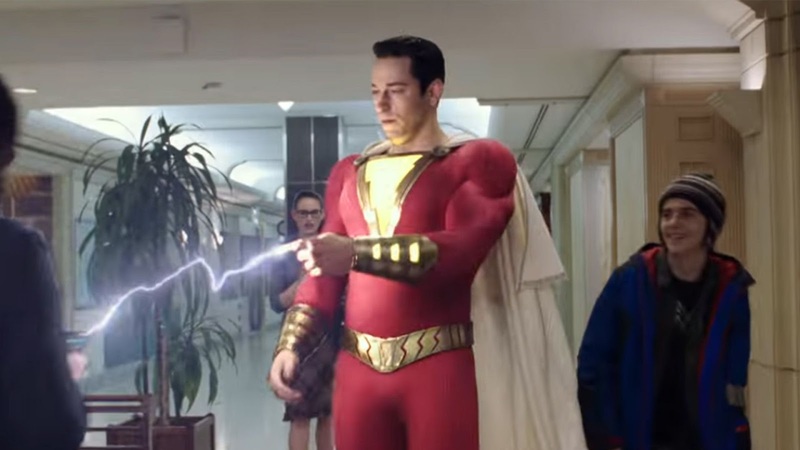 “Shazam!” stars Zachery Levi (“Chuck,” “Tangled”) as the titular role as a teenager-turned-superhero Billy Batson who harnesses magical powers bestowed on him by an ancient wizard. In this latest entry of the DC Universe, Billy Batson (portrayed by Asher Angel and Zachary Levi (in a superhero form)) is set to move into his new family’s home with the other five foster kids. When he finds himself transported into an ancient world where the ancient wizard transforms him into an adult with superheroes, he must learn to use them responsibly in order to prevent the obsessive Dr. Thaddeus Sivana (portrayed by Mark Strong) from taking his powers away and commit villainous crimes in the city. Zachary Levi plays as the superhero version of Billy. He does a fabulous job on his role of Chuck from the show “Chuck” and Flynn Rider from Disney’s animated film “Tangled,” Levi does a great job with the role, nailing both the physicality and humor. Sure, he can be immature and childish at all times, but Levi plays it perfectly. With the CGI and special effects the filmmakers being used for his Shazam role, the filmmakers done a perfect job on giving the looks and personality for Levi. Not to mention the Mark Strong on his villainous Dr. Thaddeus Sivana character, he really fit the bit on playing the role as a villain that was reference from the “James Bond” films and “Indiana Jones” films. Based on the creation of DC’s Captain Marvel (not to be confused with the Marvel film starring Brie Larson) and the 1941 black-and-white film “Adventures of Captain Marvel,” “Shazam!” provides a unique storytelling with a big boom, degree of excitement or fanfare of any kind. It delivers a stunning turn of events that became a nod to the “Superman” films including the classics and the DCEU films. Even the movie style and the Shazam character matches the resemblance from the “The Flash” television series. Let’s not forget about the action which is vibrant and so are the producers and editors who always make it easy to tell what is happening in the scene. However, the first ten-to-fifteen minutes of the film got me off-course and confusing because the setting of the ancient world doesn’t have any clues or unexplainable knowledge to see why or how it happens. I didn’t really enjoy parts of Mark Strong’s performance as he seems to be too cheesy to digest the action and scenes centering on him. Aside from Zachary Levi himself, I heavily enjoyed the children cast, consisting of Jack Dylan Grazer (2017’s “IT”), Grace Fulton, Ian Chen, Faithe Herman, Jovan Armand. They both done a terrific job on keeping up the paces on the acting and the comedy for a background. The children cast also plays the role for the story’s dynamics. Also returning from another film that was part of the DC Extended Universe is Djimon Hounsou who played as Fisherman King in 2018’s “Aquaman.” He provides some sort of a dark, deeper, and serious tones for his character just like he did when he encountered Arthur Curry/Aquaman. Despite being a superhero film, “Shazam!” is a story about a kid who is desperate of searching for his old family to be back together, but must learn to accept the new, unexpected family no matter what. When it comes down to it, “Shazam!” is a great time at the theater. The sounds of people’s laughter just grew louder and louder after the cast delivers the punchlines and the funny dialogue. It is fun, hilarious movie with heartfelt moments for kids and teenagers. It would been a tough decision to decide which movie to watch for your own amusement. I really wanted to enjoy this movie, but the “oohs, “aahs,” and “wows” are missing right there. If you want to head over to the movie theater, put up a “proceed with caution” sign.